Last Friday, a fire at Fisher Plaza in Seattle knocked out a number of popular websites, including Microsoft Bing’s recently launched Travel portal. The site was back up by Saturday afternoon, but not before Google caught the site’s placeholder “Bing Temporarily Unavailable” page and added it to its index (you can see the cached page here). Now, five days later, “Bing Temporarily Unavailable” is the second search result offered when you search Google for “Bing”. It doesn’t take much to picture Google CEO Eric Schmidt cackling with glee over this. This would be amusing enough on its own — It’s been days since Bing was last unavailable, and while I’m sure Google’s automated bots caught the page while it was actually down, it’s strange that it is taking this long for it to recognize the updated page. Bing may currently see traffic that pales in comparison to Google’s, but it’s no slouch either, and many much smaller sites are indexed by Google on an hourly basis. 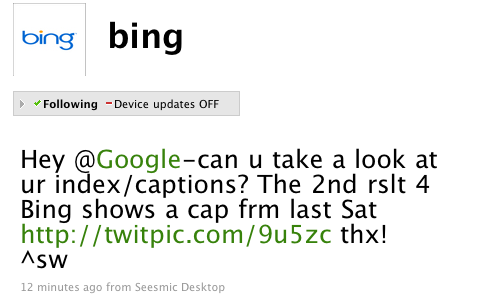 But it gets even better: Bing’s Twitter account just sent a message directed towards Google’s, asking if they could take a look at their index and captions. This might seem like a trivial goof on Google’s part, but it could actually have a fairly significant impact. Given how many people rely on using their browser’s integrated search box (which is often set to Google) rather than their address bar, I suspect there are quite a few queries for “bing” on Google every day.